The characters – wonderful, crazy and colourful – who live between a wind pump and the blue horizon. Every town needs its champion, and the Western Cape Karoo settlement of Murraysburg has one in the cheerful form of Adri Smit. Friendly encounters with South Africa’s own Robinson Crusoe, Ben Dekker. Thanks to Gussie and Baba Botha, Vukusebenze Shelter in Cradock is a living testament to the kindness of local people and visitors. Thomas Lord of Alicedale Farm near Steynsburg is a world-class pianist, and an equally gifted fossil hunter in the Karoo. Yet still a teenager. 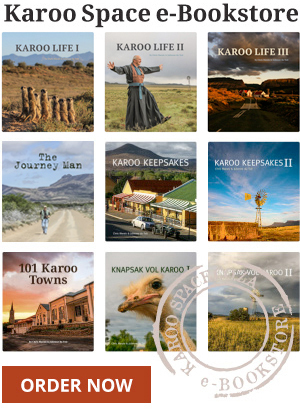 Graaffrikaans – it’s how we talk out here in the Karoo. Fly fishing with Alan Hobson of Somerset East.